Introduced in 1963, The Rolex Cosmograph Daytona was engineered to meet the essential demands of professional racing drivers, a reputable watch dedicated to the high-performance world of motor sport. Its notably reliable chronograph and bezel with tachymetric scale allows drivers to precisely measure speeds up to 400 kilometers or miles per hour. Authoritative, powerful, and striking are qualities often associated with Rolex watches. 'Sporty' is another adjective that can be used to describe the Rolex Cosmograph Daytona watch collection. They have been popular among the world's best race car drivers since their introduction in 1963. Not surprising, since these watches were specifically designed to meet the exacting needs of professional motorsport drivers! Rolex served as the official timekeeper at the prestigious Daytona 500 race for the first time in 1962. When they released their new chronograph watch the following year, they named it 'Daytona' to honor the race that inspired it. These high-performance watches are an essential tool for professional drivers. 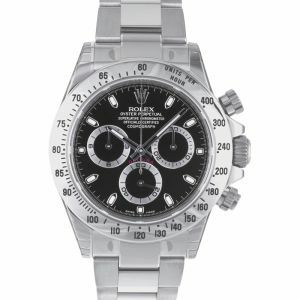 Rolex Daytona watches feature an extremely reliable chronograph that is noted for its accuracy. The iconic Rolex bezel includes a tachymetric scale that can measure speeds precisely. This is an essential feature for accurately timing laps during those high speed motor races. Racing professionals know they can depend on their high-performance Rolex Daytona watches during even the most challenging races. 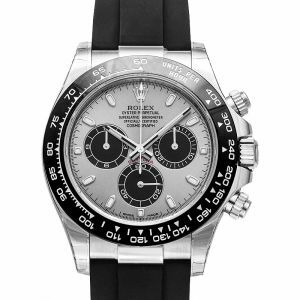 To anyone who owns one, it is obvious that Rolex Cosmograph Daytona watches are engineered to perform. They come in classic Oystersteel, elegant 18ct gold, and refined platinum. They are also available in Rolex's patented two-tone Rolesor finish, which combines stainless steel with 18ct gold for the perfect combination of strength and elegance. Daytona watch faces are available in several attractive colors and color combinations. Black, chocolate, champagne, white gold, and rose gold are just a few of the available colors. Daytonas are available with Oyster bracelets or quality leather straps for your wearing comfort and pleasure. Both choices are equipped with our special Oysterlock clasps for the ultimate security. 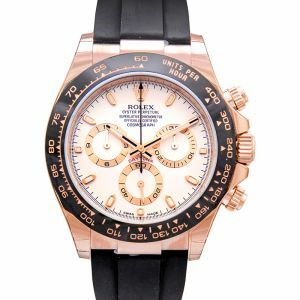 Our Rolex Cosmograph Daytona watches are available in a range of prices for the discriminating wallet. They start at well under $20,000 for a good used model. Prices increase based, in part, on the rarity and aesthetics of a particular model. 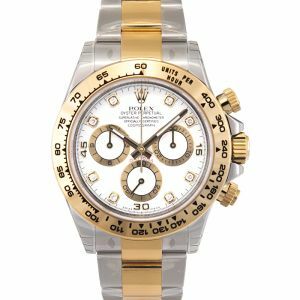 All of our Rolex Daytona watches are guaranteed to be 100% authentic and from authorized sources. Each watch you purchase will include an original warranty card from the manufacturer, as well as a new box and all of its tags. If you choose one of our select used Rolexes, you can rest assured that it has passed our rigorous inspection process. That inspection ensures that a used watch is a genuine Rolex in excellent working order. At WatchShopping.com, we are committed to being your trusted online watch marketplace! If you're looking for the ultimate chronograph, this may be it. 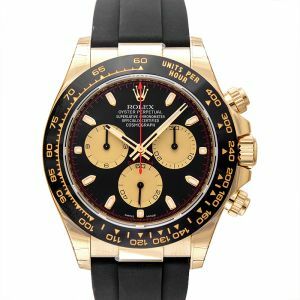 The Rolex Daytona has been a top choice for Rolex for years! That's not a shocker since it comes in a variety of colors and features all the options you may need. It was created for professional racing drivers, so you can only image the precision and the fine details on this timepiece. It's sleek, it's sophisticated and it's one of Rolex's best.